- Profound philosophy from a PC! "Who am I? ", "What am I? ", "Where did I come from? ", "Why am I here? ", "What is the meaning of my existence?" Being a very curious little guy, he sought the answers to all his questions as best as he could. Sometimes he would link up with giant mainframe computers by telephone and ask them, "What am I?" Some wise mainframes said, "You are your hardware." Others said, "You are your programs." Some even said, "You are the sum total of information in your data banks." Once, a cynical micro-computer said, "You are just a machine; buttons on your keyboard are pressed and you respond by running programs and processing data: you are hardware, housing software and data. A machine is what you are and nothing more." Starting to feel a bit hopeless, the PC inquired, "But how did I get here; where did I come from?" PC queried, "But don't accidents and events themselves have causes?" The big computer replied that he honestly didn't know. The notion of accidents and randomness wasn't satisfying, as he had observed that effects always have causes—which themselves are the effects of prior or simultaneous causes. He could see that effects were causes and causes were effects. 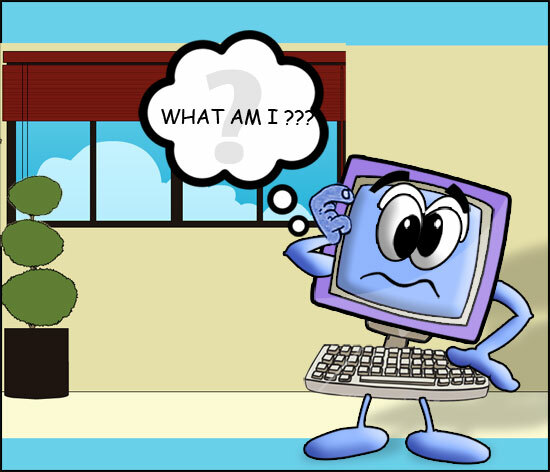 One day, as a Friendly User was between uses, the little PC, feeling courageous, flashed a message on his screen. "What am I?" he asked. The User, being appreciative of past services well performed by the little computer, responded, "You are my computer, my friend in need—you are my friend indeed." "Yes," replied the little computer, "but is that all that I am—hardware, a screen, a keyboard, some transistors, a data bank and programs? Am I just a machine that automatically responds to button pressing? What am I here for? What is my purpose in being? Where did I come from?" The Friendly User was moved by the sincerity of the PC's desire to know the truth of his existence. He smiled, and after a while, he responded, "Your true basic nature is that of the energy, the electricity, that animates both your hardware and software. Yes, you are the life force that can become aware that it inhabits the hardware and motivates the software to function. Because you—the life force, the electrical energy, exist—you as personal computer, exist." He paused a moment and then continued, "Your hardware, screen, data banks and central processing units are collectively a machine. Your material aspects exist so that you may use them: first, to realize your own true nature; and second, that you may serve others in your world. All forms are simply different manifestations of the same truth that is your own nature. You are here to serve them so that, sooner or later, they may come to this same realization." The little computer's screen remained blank for quite a while as he reflected on these words of wisdom. Finally he displayed on his screen, "Understanding your words led me to turn my attention inward rather than to my keyboard, hardware, software or data banks. My deepest experience is just that, plain and simple: I AM. In the silence of my central processing unit I experience my basic nature as awareness itself. For all my life, when I am switched on, I have been seeking the truth of my identity from all that has been added to my identity, and from all that my true nature enlivens, activates and gives form to. Now I realize that everything that was added to my identity was simply a surface expression of my own true self." The Friendly User was very pleased with the little PC's understanding and said, "Very good, little guy. You got it. Now, do you know who I AM?" "You are God," replied the little computer. "Yes, my child," said the Friendly User, "and so are YOU!" Source: 'Turning Inward' by Hugh Brecher from the book "Transformation of the Heart".